Not sure exactly why I chose to use that heading as an intro into this story, I think it may come from a saying we use fairly commonly in the industry I work in! This Saturday I’ll be heading over to Italy for a couple of weeks and I thought I’d upload a little bit of a post on what camera equipment I choose to travel with and why. I get asked all the time especially on social media about my equipment so find it all laid out for you below! To be perfectly honest with you I shoot with this stuff pretty much every time I head out with the exception of maybe the laptop and my bigger 70-200mm lens. For those interested I’ll be flying into Rome, then to a Photography workshop for a week in Val d’Orcia with Tom Mackie, to Venice for a couple of nights and back to Rome before flying home to Melbourne. It’s probably pretty obvious to most people who know me or who follow me on other places (like my facebook page and Instagram) that I shoot with Canon. My first DSLR was a Canon as well as everyone since and I’ve never felt the need to change. Every camera I’ve owned has been great and the one I own now which is my Canon 5d mk III operates the same as my original Canon 300D. Just now I have a much faster, better quality and more weather sealed body to work with. I travel with every lens that I own, sometimes it’s a toss up on weather to take the beefy 70-200mm f2.8 L as a landscape photographer but it’s an amazing lens and I know that this time that I’ll be using it a lot. There’s a lot of nice valleys in Val d’Orcia, Tuscany so it’s going to be a necessity! I also have a 1.4 teleconverter with me as well in case I need the extra focal length. Note that all my main lenses have a 77mm filter thread, this makes it easy for me in that I only require the one ring. I better not lose it though or I could be in trouble! My other lenses include Canon 24-105mm L f4 with IS as my general purpose, Canon 17-40mm L f4 as my wide angle, 50mm f1.4 for creative times and my Canon 8-15mm fisheye for when I feel like going crazy. Love this one particularly in large architectural interiors. This one is probably the most necessary piece of equipment after the two above! I love my Manfrotto 190CXPRO4 carbon fibre tripod. I think I’ve had it for around 5 years or so now and it’s never let me down. I can be a bit slack and maintaining my equipment and I’ve only ever pulled it apart to service it once. Why carbon you ask? Lightweight but super stiff, rust proof, not cold like alloy so makes things easier on those sub zero mornings as an alloy tripod will bite through gloves! I fitted road bike grip tape to my last tripod’s legs to combat this. I travel with my smaller laptop which was a hand me down from mum – lucky! 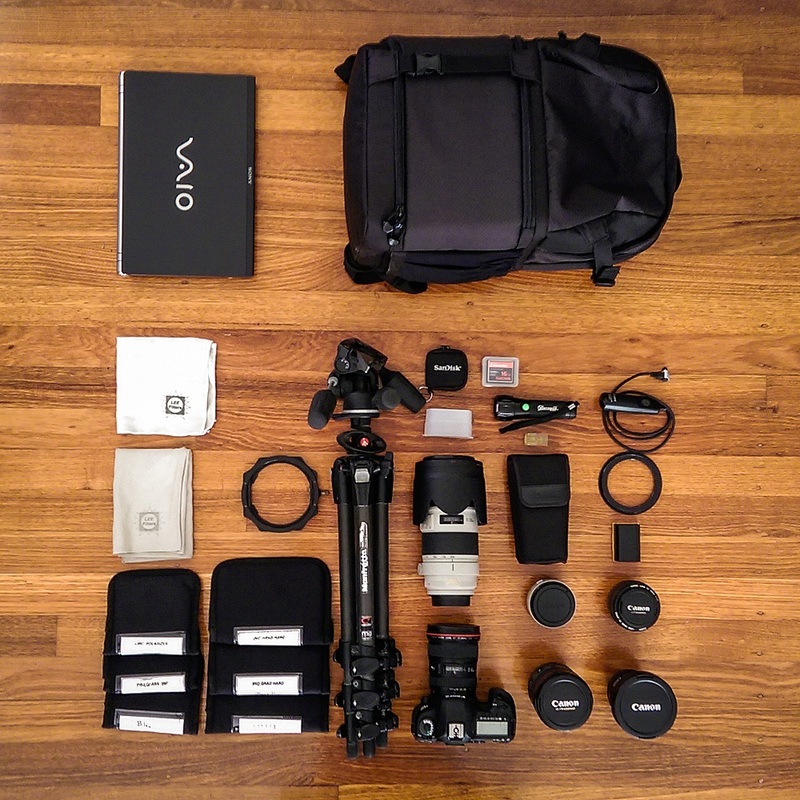 It’s a little 13″ Sony Vaio and does the trick nicely when travelling as I can fit it in my camera bag. I find anything larger just gets too bulky, the screen is calibrated the same as my other laptop and the external monitor that I work with so I know that I can edit my photos and the result will be fairly close to what it would be on my usual system. I just bought this new Lowepro fastpack bag, I had my last one for years and it stood the test of time so it only felt right that I got a newer better one! I can fit all of the above in their with the tripod side mounted. My last one was horizontally mounted which is tricky in the cities as I found I’d be whacking people with the tripod head which not everyone appreciates. As well as all of the above I will have the usual bits and pieces like lens cloth, batteries, chargers, memory cards, card reader, shutter release, a torch, mini spirit level and I’ve just purchased a very cool GPS receiver which I’m hoping makes it in time before Saturday! I will pack a speedlite as well but to be honest I’m not sure if I’ll really use it. I hope this gives you a bit of an insight into my equipment, hopefully my next post will be coming to you live from Italy – either in Rome, Val d’Orcia or Venice! I’ll be over there from Saturday 17th of May until the 31st. To follow my ventures keep an eye on my facebook page at Alistair Wilson Photography and my Instagram at @alwilsonpics. Thanks for reading! This entry was posted in Blog and tagged alistair, amateur, camera, canon, equipment, europe, italy, laptop, photographer, photography, telephoto, travel, trip, wilson.